For most of us, Wi-Fi has become our preferred way to connect our Macs to other networked devices and the Internet. However, most of us also have times when those connections slow down or fail altogether. When that happens, however, there are several things you can do to diagnose and (ideally) fix the problem. The thing to remember about Wi-Fi is that it’s a form of radio: Signals are passed to and from your Mac and your router (and any other networked devices) by transmitters and receivers at both ends tuned to the same frequency. While the information being sent might be digital in nature, the medium it rides on is analog. As such, the ability to transmit and receive data via Wi-Fi is dependent on two things: the strength of the signal between those transmitters and receivers; and the volume of interference—unusable “noise”—from other devices using that same frequency. The analogy is to listening to the radio in your car: Sometimes, the signal gets weaker as you drive farther away from the station’s transmitter. Other times, even if the signal is crisp and strong, you might hear two different stations—one you want to listen to, one you don’t—on the same channel; that’s noise. The Wi-Fi signal strength goes up when you are closer to the router (shown by the arrows here), and drops off as you move away from it. The noise level in this example is constant, so the signal-to-noise ratio (top graph) simply follows the behavior of the signal. In general, for the signal measurement you want to see values of -10 to -70 dBm (decibel-milliwatts); for noise, -80 to -100 dBm. As the levels of the signal and of the noise get closer to one another, your wireless connection will begin dropping data packets and requiring that they be resent. This will slow down data transmission, and potentially cause your Mac to drop its connection altogether. If you are having problems with your Wi-Fi connection, and you’ve checked Wireless Diagnostics, the numbers there (and the radio analogy above) should give you some clues about how to fix the problem. One of the most fundamental things you can do is change the position of your Mac, your router, or both. Move closer to your router As you move your Mac farther from your router, signal strength will decrease. 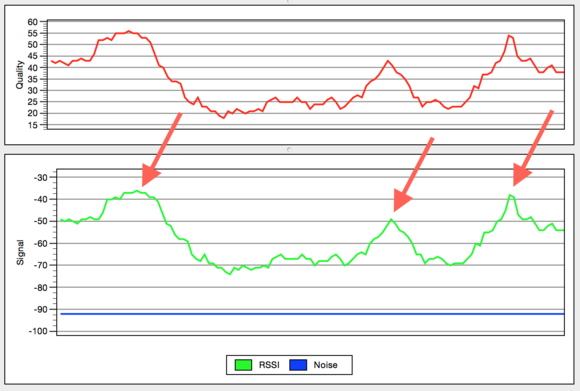 Therefore, try moving closer to your router until you see the signal graph on the Wi-Fi monitor move higher. Get away from obstructions Large metal objects, window coatings, wires and pipes in walls, and other electrical devices can either block your Wi-Fi signal and decrease its quality, or introduce noise. Therefore, try moving to a new location, away from such obstructions, to see if this improves your signal. Increase your router’s radio strength Some routers have options for changing radio power, which can not only help increase the quality of the signal your Mac receives, but also increase your router’s range. If you have this as a configuration option for your router, then try setting it to its maximum. 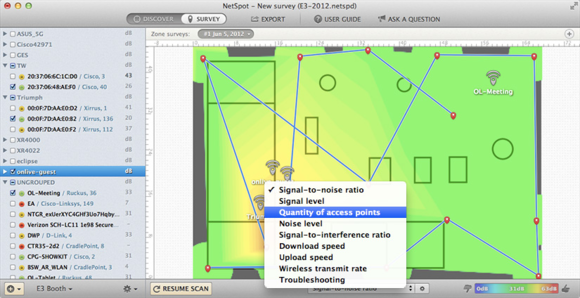 NetSpot's ability to map signal quality may help you determine dead spots in your office or home. Draw a map One useful approach for assessing poor signal issues is to map the Wi-Fi quality of your home or business. To do this, you can use a program like NetSpot, in which you can draw a scale plan of your building, and then move your Mac (provided it is a laptop) to various locations and chart the measured signal qualities at each one. You can then see if the signals drop off smoothly with the distance from your router (as you’d expected) or if there are any dead spots where signal quality falls off unexpectedly. In doing so, you can see if specific walls or rooms contain hidden shields that could be blocking the signal, and then be able to situate yourself and others accordingly. Reset your router by turning it off, unplugging it for a minute or two, and then turning it back on. Change your router’s channel or radio, if your router allows you to do so. 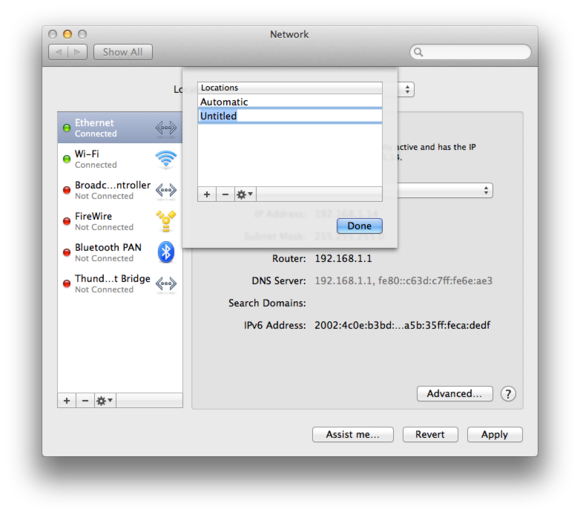 Disable and then re-enable your Mac’s Wi-Fi connection using the Wi-Fi menu. Upgrade OS X to the latest version if you have not already done so. Run Apple’s hardware tests; if any errors crop up (especially anything pertaining to networking and Wi-Fi), you can then investigate them further. Try a new network location by going to the Network system preferences and then choosing Edit Locations from the Location menu, followed by clicking the plus button to create and name a new location. This will populate the new connections list with all of the current networking hardware ports, and give them new configurations to work with. Clear your Mac’s network configuration by going to the /Macintosh HD/Library/Preferences/SystemConfiguration/ folder and removing the following configuration files: NetworkInterfaces.plist; com.apple.airport.preferences.plist; com.apple.network.identification.plist. After doing this, restart and then set up your Wi-Fi connections again. Note that this will remove most of your network settings, so any specific customizations you have made will need to be re-established. Changing your network location in this panel will provide the system with new configurations for your network ports. Chances are very good that, by the time you get to the end of that list, you’ll have fixed whatever problems you might have had. But chances are also very good that, as time goes by and your hardware and software change, as you use your Mac in new places, Wi-Fi problems will crop up again. But at least you now have a game plan for fixing them when they do.